Visiting with Kids? We’re delighted! … Being both Black and a woman isn’t just having two different sources of bias and prejudice that work against you. The two intersect in a way that makes things far worse. The word intersectionality was coined by Kimberlé Crenshaw back in 1989 to describe the isolating uniqueness of that intersection. She found a focus for it in a Detroit automaker that wasn’t hiring Black women. The company claimed it wasn’t discriminating against Black people because they were hiring Black men to work on the assembly line, and in significant numbers. The company also claimed they were not discriminating against women because they hired lots of women to work in the front office. But the assembly line supervisors didn’t want to hire women and the front office didn’t want to hire Blacks. The courts had no remedy for Black women because they had to decide if they were Black or women. When filing a claim, they didn’t have standing as Black women because the laws weren’t written to protect them. Ijeoma Oluo, in her excellent book, So you want to talk about race, describes getting caught in another intersectional dilemma. A famous male Black singer was coming to Seattle. She doesn’t name him but I’ll guess she was talking about R. Kelly. She was venting on Twitter that the singer, who was getting a lot of positive buzz and filling up a concert venue, was also well known as someone sexually abusive to Black women and girls. Suddenly she started getting a flood of replies and threats on Twitter – by other Black folks. She had to go into overdrive to defend herself from the trolls who were trying to take her down and destroy her reputation with electronic mob violence. She survived to fight another day but the attack could have destroyed her online presence – a presence critical to her ability to work. These examples give you a taste of a term that may feel a little abstract at first until you recognize the profoundly marginalizing effects that separate and divide oppressed people. Each of us has multiple identities. Our gender, our class, our race, our sexuality, our heritage, our abilities and disabilities, our politics, our religious views, our education and so much more. Some of those identities experience marginalization and others don’t. The privileged are the ones that get the affirming nod from the white supremacy culture, that is, those who are white, college educated, financially secure, cis-gender, heterosexual males. Everyone else has at least one strike against them. Having two or more strikes isn’t just a little worse, it can be disastrous, especially if you are Black and female. Intersectionality unpacks that reality and gives it a name. As Oluo’s Twitter attack illustrates, having one marginalized identity doesn’t mean the people who share that identity will have your back for another identity. During the Civil Rights Era, many Black women were very frustrated that their attempts to be part of the leadership were rejected – by Black men. Most Black churches do not embrace Marriage Equality. The Korean Presbyterian Church is very patriarchal and strongly resists the ordination of women. Unfortunately, experiencing one source of oppression doesn’t translate into offering support for fighting all sources of oppression. The intersectionality movement we see today, often led by Black women, strives to envision a different way for society to operate that dismantles all these oppressions. It hopes to bring people together across race, class, gender, sexual, educational – just about any category you can imagine – with a common focus of fairness, equality, justice and liberation for all people. Toward that end, this movement is evolving away from the process of normalizing and privileging any identity. Being any gender or genderless shouldn’t matter in how we relate to each other. My racial heritage shouldn’t advantage or disadvantage me. Neither should my sexuality, or my ability. We should be striving to make accommodations for everyone to live to their fullest potential, bringing their gifts to the world of who they are in the uniqueness of their intersection of identities. This discourages the universalizing of any of those identities thus norming and privileging them. Each of our narratives bring a richness of our individual intersectionality as a creative source rather than an inventory of limitations. As our society has begun to recognize that discrimination and oppression are unjust and don’t fit with the purposes laid out in our US Constitution, legislation has been passed to address each one individually. We have laws to prevent discrimination against people in a number of different categories, or different axes. The problem with dealing with oppression one axis at a time is what happened at the plant Crenshaw describes. The intersectional approach says we need to pay attention to multiple axes of oppression at all times. What unifies the intersectional approach is a focus on outcomes. The goal of the intersectional approach is promoting justice, equity, and compassion for all people regardless of their identity. Source for “All Oppression is Connected!” image – Names the artist and talks about his design. 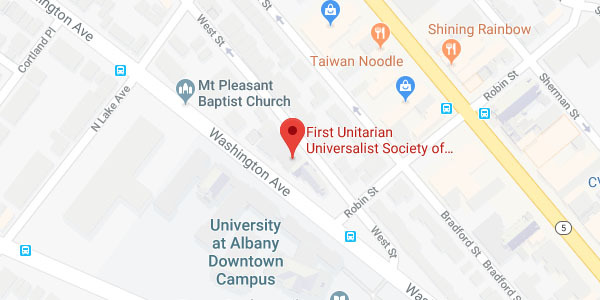 © 2019 Albany Unitarian Universalist.